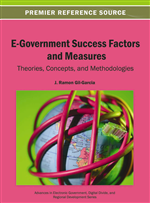 In this chapter, the authors examine the criteria to use in assessing the success of e-government projects. Through an empirical enquiry based on case studies of e-government projects by Tunisian government agencies, they found that the interviewees distinguish between the project management success and the success of the deliverable. This empirical enquiry also revealed that the interviewees have made an emphasis on the success of the products delivered while the success of the project management process was relegated to a second order. The findings are used to propose a grid of the metrics to assess the success of e-government projects. Since the years 1970-1980, government agencies have introduced information and communication technologies and information systems to computerize administrative procedures and reduce costs. E-government concept has been introduced in the public sphere since the years 1990. It refers to the adoption of information and communication technologies (Internet, Intranet, EDI, etc.) in internal and external processes and management systems of government agencies. E-government initiatives have a large potential in developing and delivering better services, and in providing possibilities to interact more openly with agency constituents as well as a potential to transform government structures and processes (Melin and Axelsson, 2009). However, reports on failure of e-government projects are common (Melin and Axelsson, 2009). In this context, e-government initiatives success becomes critical to take advantage of their potential. The success of an initiative means that most stakeholder groups attain their major goals and do not experience significant undesirable outcomes; although there will be subjectivity in identifying such outcomes (Heeks, 2003). So, as governments use information and communication technologies and develop systems to deliver services, there is a need to develop and understand the criteria which best measure the success of e-government systems. Developing such criteria may help project team to encompass the risk of failure of the project. The need to understand the success of e-government and to develop criteria to measure it are even important since success of e-government systems is considered as “a complex concept, and its measurement is expected to be multi-dimensional in nature” (Wang and Liao, 2008). Several researchers have studied the success of information systems and information technologies projects carried out by economic enterprises (DeLone and McLean, 1992, 2003; Seddon, 1997). On the contrary, research which deals with the evaluation of information systems success in public organizations seems to be scarce (Almutairi, 2001). The author has proposed that measuring information systems success in a context of public organizations needs more exploration. Scarcity of research on measuring the success of e-government systems is also highlighted by Wang and Liao (2008) and Floropoulos et al. (2010). So, in this research, the authors try to respond to the following question: what are the criteria that can be used to assess e-government projects success? The purpose of this research is to contribute to a better understanding of the criteria to use in assessing the success of e-government projects. Identifying these criteria can help project managers to consider the appropriate factors to deliver success (Wateridge, 1998). Addressing this issue may be justified by two arguments. The first one is the scarcity of research highlighted by many authors (Almutairi, 2001; Wang and Liao, 2008; Floropoulos et al., 2010). So, a contribution to reduce the lack of literature on the topic may be made. Indeed, Wang and Liao (2008) emphasized the need to develop and understand the criteria that measure the success of e-government systems for greater efficiency of Web-based applications. Floropoulos et al. (2010) also noted that the criteria to assess the success of e-government systems deserve further investigation. The second argument is related to the fact that the need to conceive a tool for evaluating online services of Tunisian government agencies is further emphasized (Sellami, 2011). Indeed, some of the adopted standards (Internet access indicators, owning personal computers, number of computers in the administration, number of e-services available, number of Web sites, and the average number of visits to Web sites) by Tunisian government agencies are among those used worldwide (OECD, 2007). But, these measures seem to be a part of a holistic approach of e-government assessment and they are not developed in a particular context, while e-strategies and goals may be different among countries.